Spring begins here at the equinox which will be on September 22nd here. (In the Eastern states it will occur just after midnight on the 23rd.) However, most people are celebrating it already, at the beginning of the month. The days are noticeably longer and the weather is lovely, and the garden is ejoying it also. There are also cabbages, beets and carrots along with all kinds of "leafy greens", herbs and the occasional leek. Two of the chickens are laying daily (enough eggs for me) and as the days become longer and warmer, the weeds are growing much more quickly. The kale is going to seed. I will collect some seeds from these this year, but I'm also giving some of the plants to the chickens. 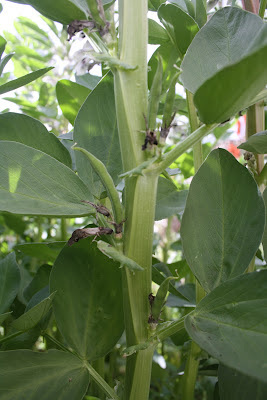 I have had more than a dozen plants that have supplied leaves for me during the winter, and I'll pick the best few (biggest leaves and slowest to go to seed) to produce seeds for next year. The other plants will go, one by one, to the chickens. The love the green leaves and their egg yolks are amazingly dark when they have such a wonderful diet. ... I can't remember whether cabbage flowers are yellow or white. ... those lovely big leaves are what is collecting the solar energy to make my garlic bulbs for next winter. These tiny beans are jsut over an inch long, and this is when it becomes an effort of will power not to have a tiny taste of fresh beans. I always try to wait until they are at least 10 cms long! The buds have been sitting there for weeks. Now that the days are longer, they open... and people don't seem to understand that plants are able to work things out. .... but I'm pleased with all that is happening here now.